I love light... I love the beauty of it and the mood it can invoke. I picked up a set of 3 round paper lanterns awhile ago at a craft store when they were half off and have always wanted to pretty them up. This embellishment project was inspired by the Glue Arts Raisen's Adhesive Squares... they were perfect to make the layered flowers that I made for the paper lantern because of their dimension. I can't imagine that another type of adhesive would have made these flowers any easier to put together. 1. Open paper lantern and insert wire base provided. Cut desired flower and butterfly shapes. 3. Stick the 3D flower to the center of the Raisen Adhesive Square that is in the center of the bottom flower. 4. Stick the blue crepe paper flower to the center of the Raisen then add small daisy like flower to the center of the crepe paper flower with a Micro Extreme Adhesive Square. 5. I also used the Micro Extreme Adhesive Squares to layer the tissue paper and book paper for the butterflies. 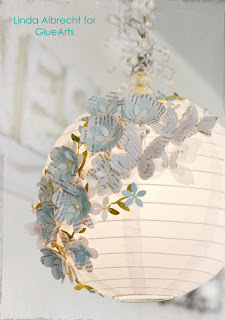 Add white tissue paper flowers and butterflies to the paper lantern using Micro Extreme Adhesive Squares before adding the 3D flowers that were put together with the Raisen's. 6. Use hot glue to adhere the pearl antennae to the butterflies. 7. Use hot glue to adhere the 3D flowers onto the white tissue paper flowers on lantern. 8. I applied the flowers and butterflies at a diagonal onto the paper lantern then just wound the green leaf trim through them, adding a Micro Extreme Adhesive Square at random to the back of a leaf. 9. Hang up your pretty paper lantern and enjoy! :-) i might go and add some more white tissue paper butterfly layers to the lantern because I love what the light does to them when it is on... so soft and serene looking. How incredibly beautiful is that? And think of all the possible styles, designs and themes you can create! Leave us a comment today and let us know how you would use ourGlueArts Raisen's for your next project! We'll enter you to win two pack of our Raisen's along with a pack of our U Cut It Foam! Both products are perfect for adding just a bit of dimension for your crafts and more! We'll pick one random winner next Monday! Can't wait...no need! You can shop online right from the convenience of your home, Ipad, Iphone, Android phone! 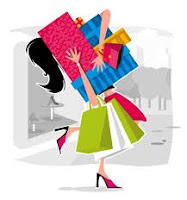 GlueArts offers safe shopping and best...FREE SHIPPING all month! Thank you for this wonderful project and inspiration! Oh that is so gorgeous! What a great idea. I'd probably use Raisen's for every single project I work on. I love dimension. Thanks for sharing that beautiful lantern. My niece would love this!! I'll have to forward this to her. "... and let there be light" - oh my but didn't Linda do a FABULOUS job on the lantern??? I would love to make one of these. Have not heard about Raisens but you know I'll be shopping for them soons. What a fabulous idea, I have a feeling we are going to see more of these beauties popping up. I'm thinking that I'd like to use them when I make a flower arrangement for my kitchen. I'd like to add a paper bird. I'd also like to try these out at work. I work at Pottery Barn Kids, and teach crafts to kids (customers). I'd like to try them out on some crafts. What a gorgeous lantern! It looks incredible. Your Raisen's are pretty versatile. They seem like they must be pretty strong if they can hold the flowers onto the round surface made of thin paper. So I hope that I win them so I can try them on many different surfaces and applications. The flowers make this so beautiful. I would use Raisen's on my cards for dimension. The lantern is just lovely! I would use the Raisens on cards of course, because that's what I make the most! Thanks for the chance to win! Oh my, that is one fabulous lantern! I would use the Raisens to add dimension to my card projects. I'm going to decorate 3 styrofoam trees with white flowers to decorate the gift table when my grandkids open their wedding presents. These Raisens sound like they would be great for layering the flower petals. Love the lantern. Another idea for the flowers. Such a great project. These would be perfect for my flowers I am always making. Love these new raisins!! These add a whole new dimension for layering. TY for this new product. Gotta love Glue Arts...I know I do. evette k.
Beautiful lantern!! 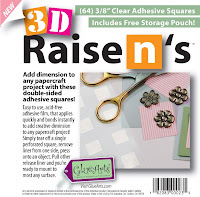 I'd use the Raisen's for making flowers too for my cards and layouts... also for other embellishments! i think a home decor project is in order. i could add flowers, feathers, or anything to the bottom of a lamp shade. Love this project!i would love to try to make one of these or a cool centerpiece for my table. What a wonderful project - such inspiration! Wow that is just beautiful. Love the lantern. would love to win some adhesive to use on my cards and pages- your adhesive is awesome. What an awesome project, just beautiful. Thank you for sharing it. Just took a great mixed media class with Vicki Boutin and these would be perfect to add dimension! Loooove the lantern, it is beautiful. I would love to make a wall hanging for my granddaughters room and Raisen's would be great to pop embellishments and flowers on the banners. Love this amazing floral paper lantern! Very amazing! Found this on Pinterest. I love this idea. Something new!! I can see expanding this theme to banners and table top decorations for a party. I'm planning a project (now that I finally got those taxes done!) for decorations for my DH's birthday. Not flowers, but maybe something motorcycle related. I would use glue dots on the many cards I am currently making! Wow! Linda, this is just absolutely fabulous! You do such beautiful work! Thank you for sharing your talents! Oh wow that is gorgeous. I want to make some butterflies and use raisens! Hermoso, fabuloso... Lo voy a hacer. Absolutely gorgeous. I am thinking of using this lantern as a compliment to our decorations for my niece's service of her passing in Sept 2012 one year ago. absolutely beautiful, what a great way to reuse paper ! I would do the project you posted....I love it! OMG! I love it!! Im a single mother in a really tight budget im trying to do my daughters sweet 16 decoration Thank you so much!! This is beautiful! Thanks for the inspiration!! Hi there! glad to drop by your page and found these very interesting and informative stuff. Thanks for sharing your thoughts about adhesives, keep it up! I noticed there is this crystal vine effect that covers the cord that hangs the lighting fixture. What is that and where can I find that to add to the look? It seems that is the only thing that is not explained which I think is the finishing touch of how magnificent it looks! Can someone please share? Can some tell me what was used at the top to cover the cord?? It's absolutely beautiful and love how it adds to the magical look of the flowers and butterflies...does anyone know what was wrapped around the cord for that crystal vine effect? I am wondering the same thing about the cord. What did you use for it? It really adds to the overall look of the lamp. I am so absolutely in love w/ this lamp. i had already pinned it long ago. So when it popped up again a bit ago, I went to pin on Pinterest and it said I already had.lol Soooo, I pinned onto another of my boards. Being disabled, i can only buy supplies a few at a time. And try to find ways to improvise. I FINALLY found the lamps at Michaels here. Made by Martha Stewart. Just ONE was so costly, even using a coupon. So, I am wondering if the ballon trick might work using a paper mache technique? The plus on that is that you could also color it lighly too, to match your decor so to speak. Maybe not "match"...but a enhancement to the color scheme? BTw....I love your website and look forward to making many more beautiful things. Thank you so much for sharing the lamp. oh my this is gorgeous. When i first saw this I knew i wanted to make one for me and one for my mom in law. went straight to the crafter store, got mostly everything but couldnt find the die cutter for the flowers and buttflys. is there an alternative that i could use instead of a die cutter to add that 3d look tot he flowers? It's Time for My Little Shoebox! !